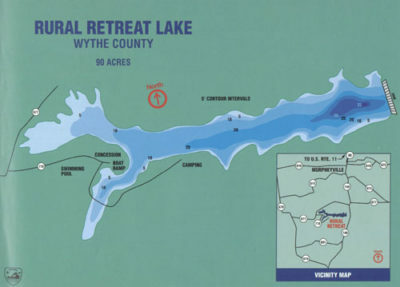 Rural Retreat Lake is a 90-acre Department-owned impoundment located near the Town of Rural Retreat in Wythe County. From I-81 or Route 11, take Route 749 through Rural Retreat, go right on Route 677, then left on Route 778. Some anglers visit the lake to fish for the muskie, which are stocked every year by the Department. With a largemouth bass creel limit of one and a minimum size limit of 18 inches, the lake provides good bass fishing. Northern pike were stocked from 1997 to 1999 to prey on small bluegill and crappie. This management strategy is working. Instead of many thin crappies, the lake’s population is definitely shifting to fewer and fatter fish. In 1995, only one percent of the adult crappies in the lake were over eight inches long. By 2001, twenty-three percent of the adult crappies were over eight inches long. The lake has good numbers of six to eight inch crappie, and anglers are likely to catch some that are up to 10 inches long. Bluegills in the lake now average about 0.5-pound. Channel catfish up to 15 pounds can be caught from the lake. A small pond adjacent to Rural Retreat Lake is stocked seasonally with trout. The lake has a boat ramp, ample shoreline fishing, picnic shelters, campgrounds, and a concession that sells food, bait, and tackle. The lake facilities also include a swimming pool operated by the Wythe County Parks and Recreation Department. The boat ramp and lake are open 24 hours a day, year-round, with the other facilities open on a seasonal basis. For information on facilities at the lake, call the Wythe County Parks and Recreation Department at 540-686-4331 or 540-223-6022.